Today I have two stories about buying plants that you can't really see. The first is from a company in Wisconsin that I've never bought from before: Prairie Nursery. I've been looking for a specific native fern for a few years now and have never seen it available locally. 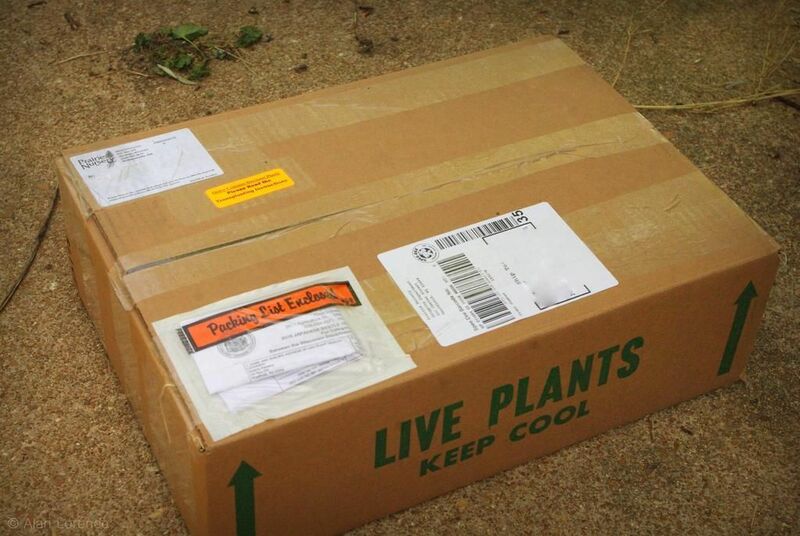 A web search, an order, and this box arrived (a couple of days earlier than I expected). Yesterday I started showing you my current favorite nursery: Greenscape Gardens. I left off at the extensive native plant area at the back of the greenhouses. Today I start where I left off, entering the greenhouse from the back with the native plants behind me. 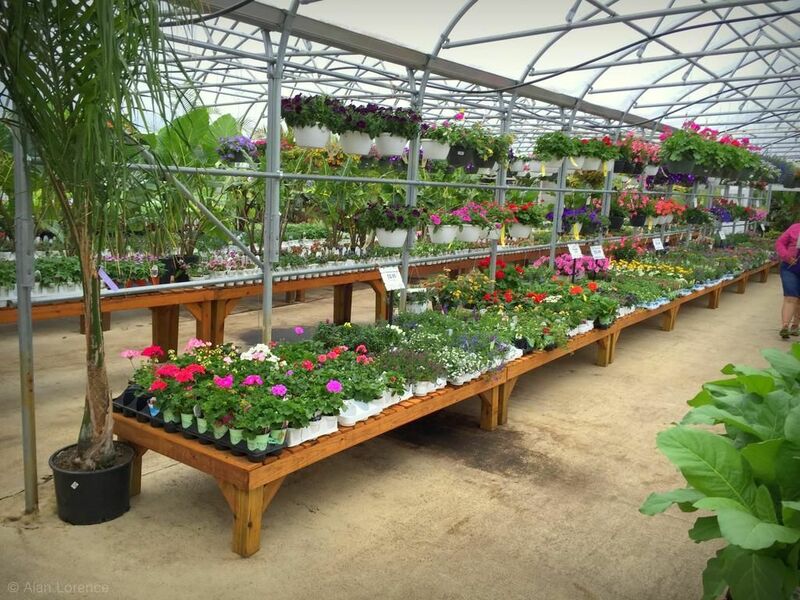 You know the great thing about doing more posts about local nurseries and garden centers? It's a justification for even more springtime visits to nurseries and garden centers than usual! It seems that I've been stopping at Greenscape Gardens every weekend so far this spring, but have not yet done a proper post about it. So today I remedy that. Like all of the local nurseries in spring, this place gets busy on weekends, so I arrived fairly early on Saturday. The signage is all at the street so I couldn't get a good shot of it, but the brand new butterfly sculpture above the entrance gives you a better introduction to what you'll find here than any sign could. A duck! 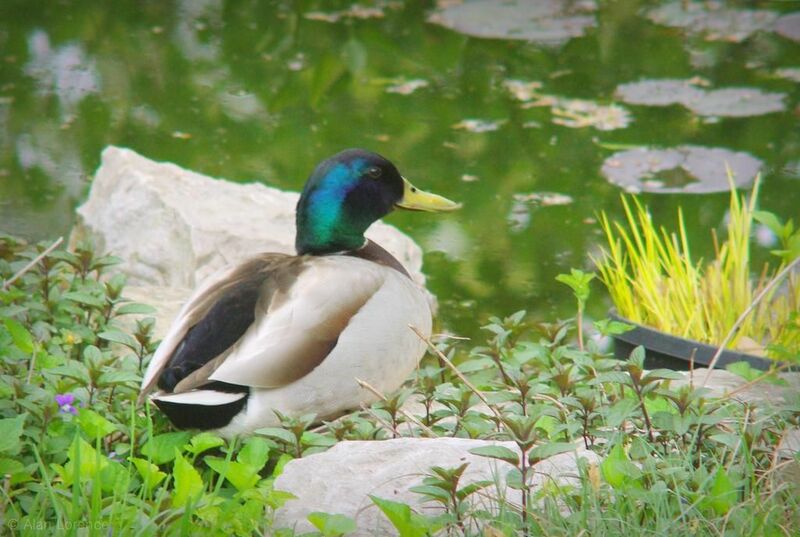 To be honest, it's my neighbor's duck. It's not a pet, but it's one of the two Mallard ducks that have been visiting her backyard for at least a year if not two. 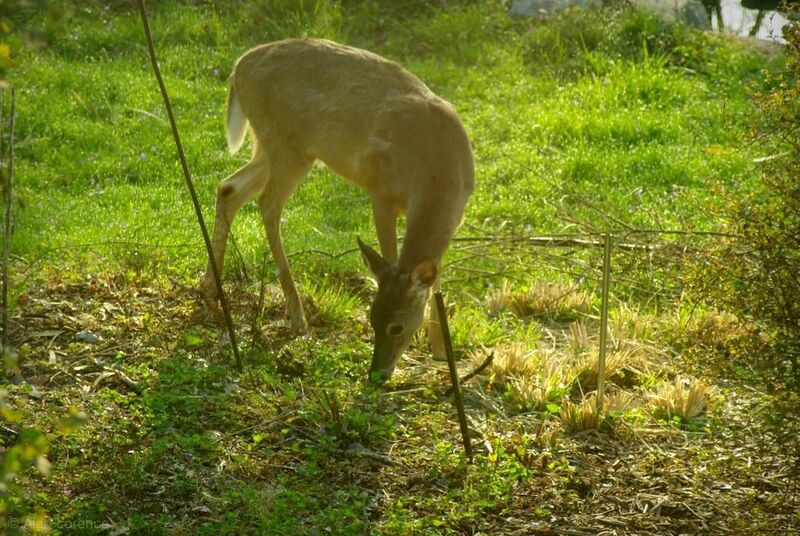 They like her messy bird feeder and small tub of water, and didn't seem to listen when she kept telling them that there's a nice little pond right across the street and down the hill. It seems they finally got the message! It's a smaller nursery in Kirkwood, MO, and unlike the other nurseries I've visited recently it's in the middle of a neighborhood -- it's clear that you're surrounded by homes when plant shopping here. 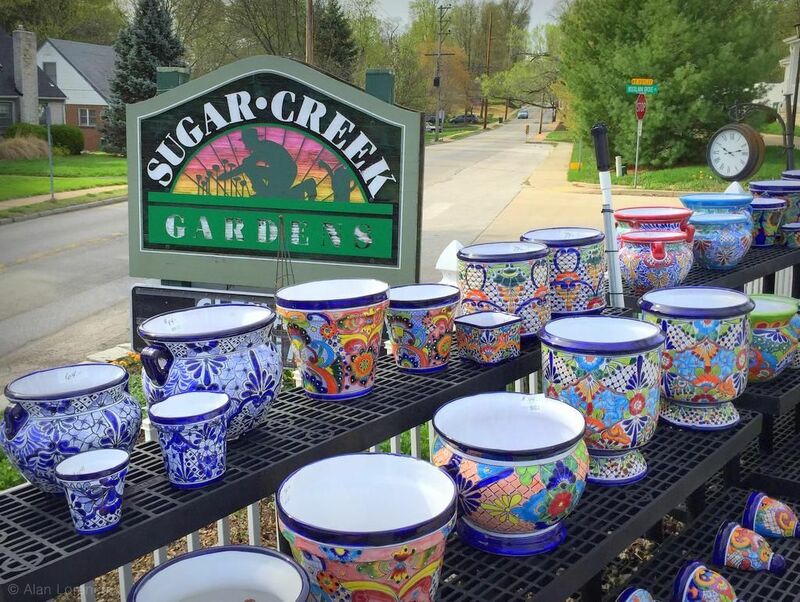 Smaller isn't a bad thing in this case, as Sugar Creek never disappoints with their plant selection. 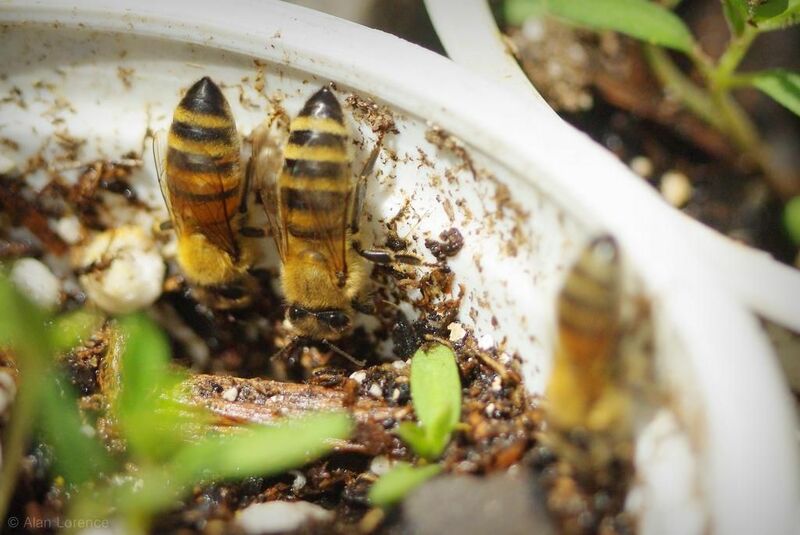 Trying to get a few things done in the garden during lunchtime the last couple of days, I noticed that the honey bees were very interested in my little seedling cups on the driveway. Noisily buzzing, a steady stream of bees landing, drinking (I assume), then flying off. It gave me a chance to get up close and personal with them. 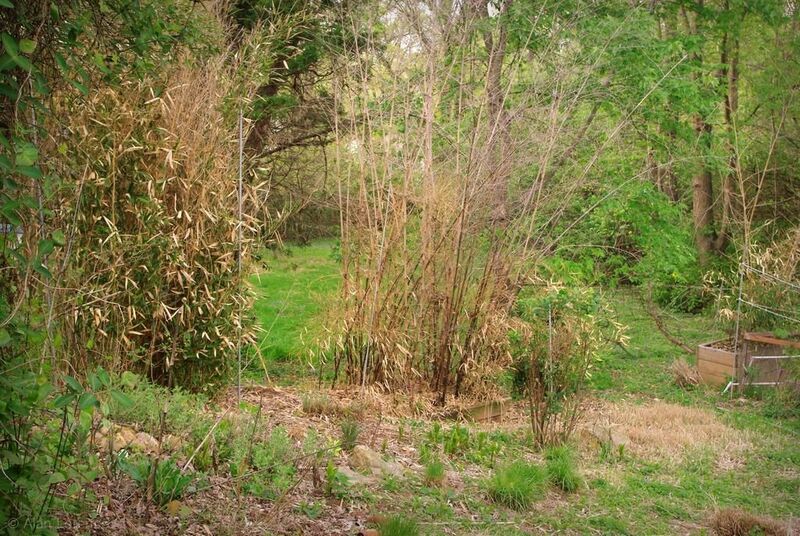 Spring is a very exciting (and conflicted) time for those of us who grow bamboo in small gardens. 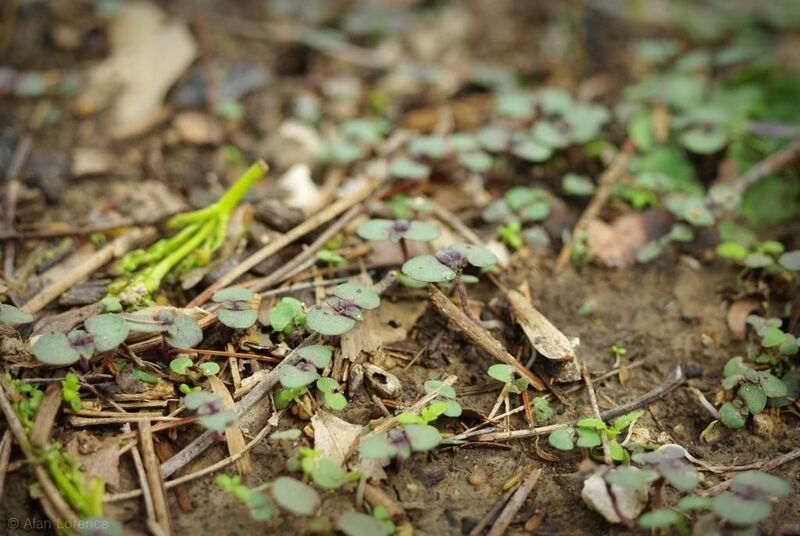 When the shoots start pushing through the soil in spring, you just never know what to expect! Yesterday's cardinal nest in the bamboo was actually the second cardinal nest in a somewhat exposed spot that I've seen recently. The first is here, in my soon-to-be-removed black bamboo. You don't see it? I often feel like early morning in the garden is the absolute best time to be out there. Even after pulling bamboo rhizomes for 30 minutes, boots caked with mud, the cool air no relief when wearing too many layers, something happens that makes the time special. I often hear other gardeners talk about some interesting "volunteer" in their garden, a plant that grew out of nowhere in just the perfect spot. For me this does happen once in a while -- except for the "perfect spot" part, as I usually have to transplant. Most of the time in my garden though the solitary volunteer is a thing I only read about. For me, seedlings arrive in hordes, great swathes of tiny plants, volunteer armies in miniature. I started showing you Wiethop Greenhouses last week, and I left off showing you the door that leads to the perennial greenhouse. 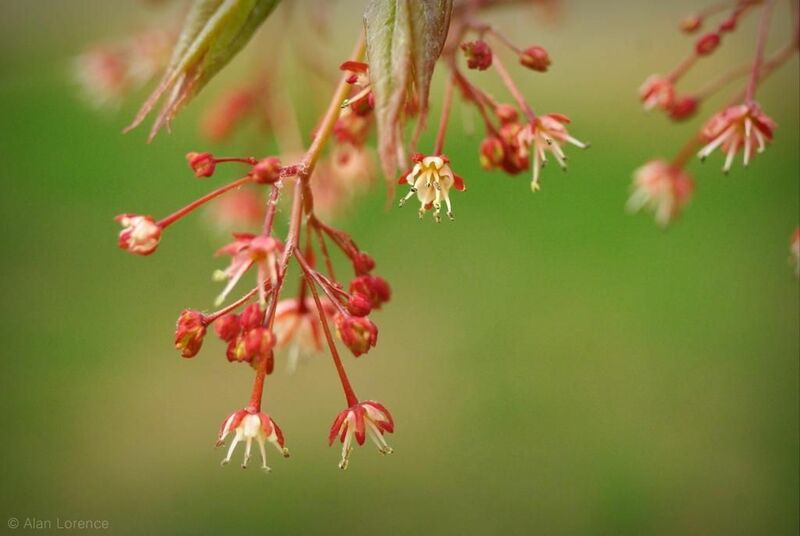 It's always wonderful to see the Japanese maples budding in the spring, quickly going from barren to beautiful. The lighting was just right a few days ago, and lots of photos were snapped. I'm determined to not only visit more area nurseries this year than I have in the past, but to share the visits with you as well -- something I've not really done over the years. 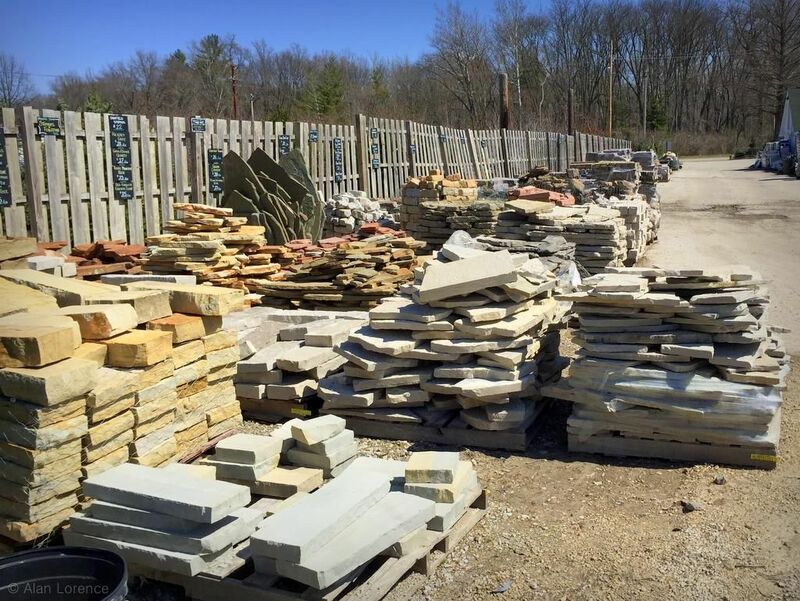 Remember the other day when I gave you a little view of Sherwood's Forest Nursery and my stone supplier Kirkwood Material Supply that was right on the other side of the fence? 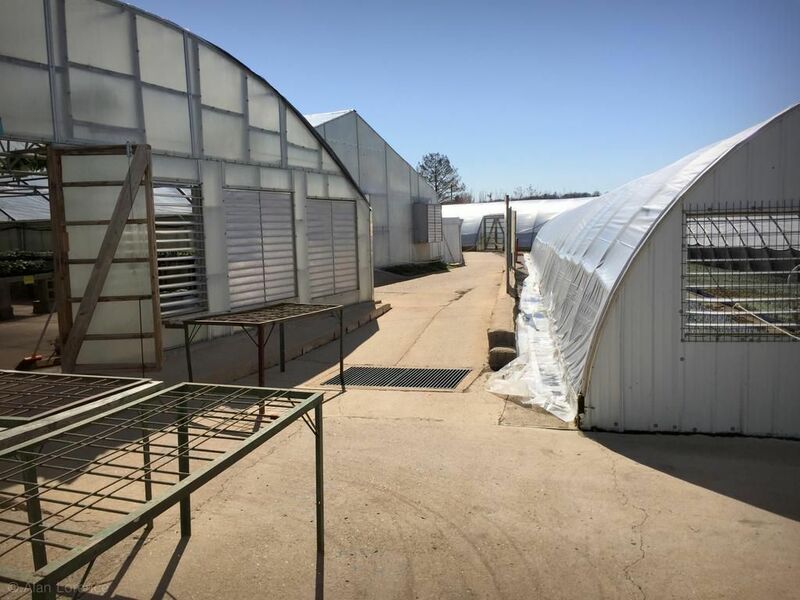 Sharing the other (north) fence with Sherwood's is Wiethop Greenhouses. 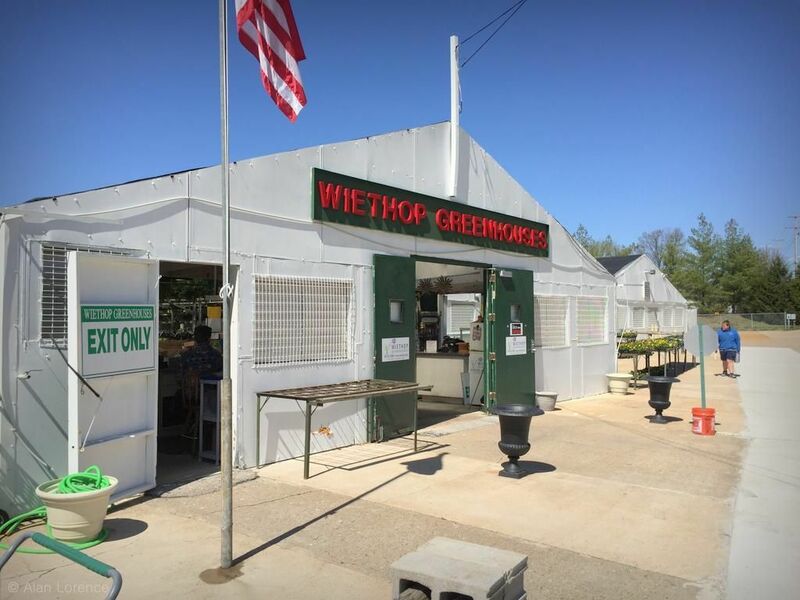 Wiethop is unique in this area of St. Louis as they're 1) open seasonally only, from early April to mid-June, then again September through mid-October 2) a grower, not just a seller of plants. Both of these things combine to make a trip to Wiethop irresistible to me each Spring. (I've never actually been there in Autumn). An appropriate subject presented itself on the window yesterday, as this unidentified bug really fits my mood right now. It's the weather you see. These intense storms, I suppose what some would call "gully washers", have been carrying away mulch, flattening tender emerging plants, muddying up the fish pond (plus awakening me way too early with big thunder and poundings upon the roof). In short, they're bugging me! ...when strong thunderstorms dumped a huge amount of water (sorry California) and hail upon my garden. 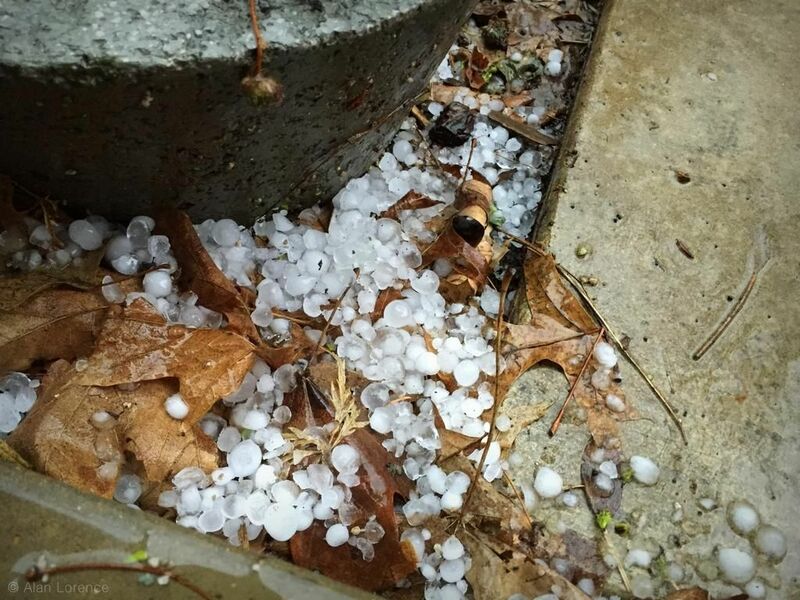 The hail wasn't the large-sized stuff that can demolish a shingled roof or dimple your car like a golfball, but there was so much of it! Things are a little busy for me with work and spring garden tasks, so forgive me if I'm a bit brief with some posts these next couple of weeks. Things move quickly in spring in St. Louis, and sometimes you have to take advantage of an early morning hour before the storms move in to get some work in the garden done. I've got another nursery visit to write up, bamboo shooting season is just starting, and there are new plants to show you -- but today I just want to share a few photos with you that say "early Spring" in my garden. 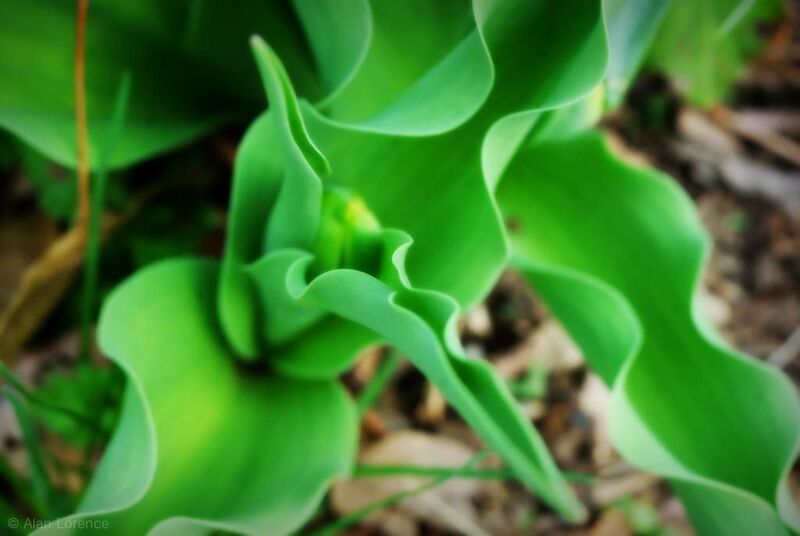 I don't have many tulips, but a few manage to keep returning, like the frilly-edged one above. My least favorite time of year? 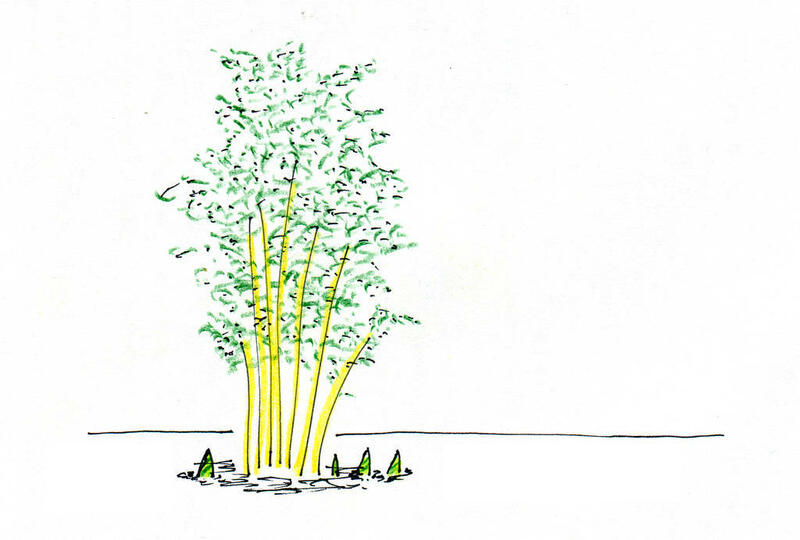 Although Spring is such a wonderful time in the garden, it's also my least-favorite when it comes to the plant that I'm most taken with: bamboo. 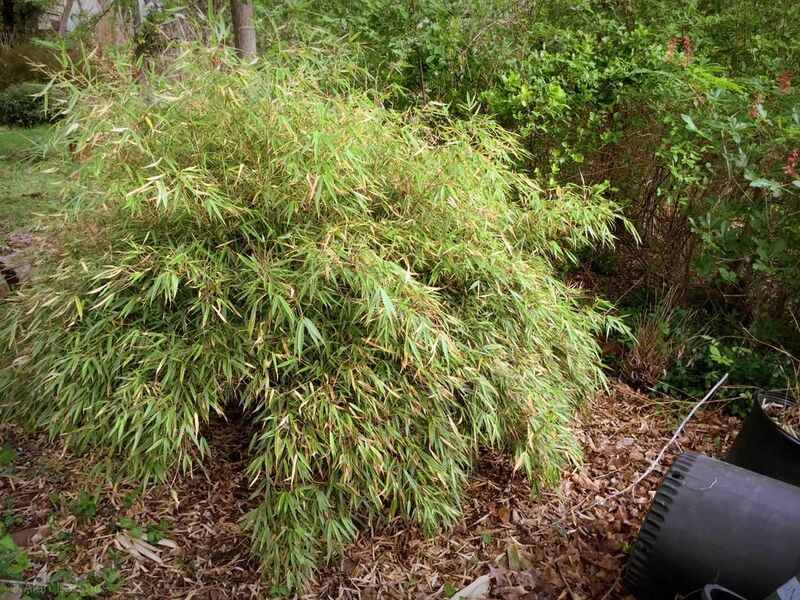 I have many shrubby and ground-cover bamboos in my yard and although some of them stay mostly green through the winter months, the leaves that looked quite good during the cold, snowy days look tattered and tired when side-by-side with fresh growth. So that means a yearly pruning to remove the tired foliage. 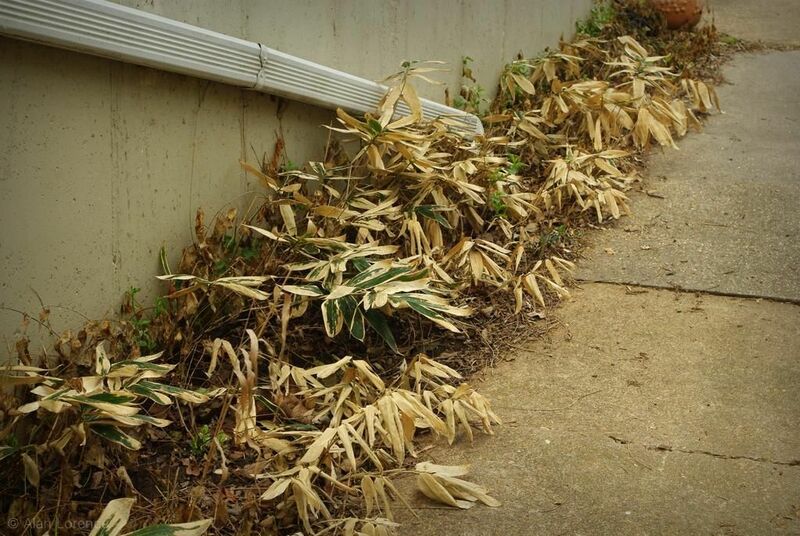 With some of the plants like the Sasa veitchii above it's a simple task, as every single leaf shows significant damage. Removing them all is required and I don't hesitate. 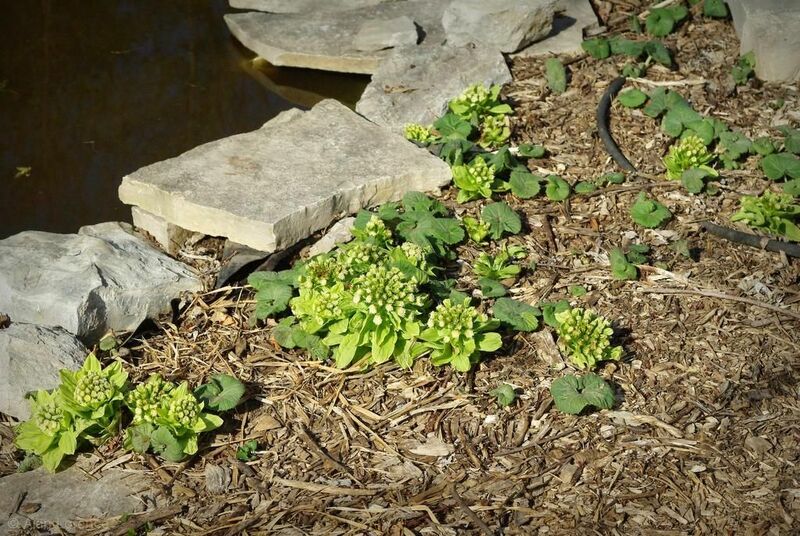 Petasites japonicus is the large-leaved plant that I grow at the edge of my pond. 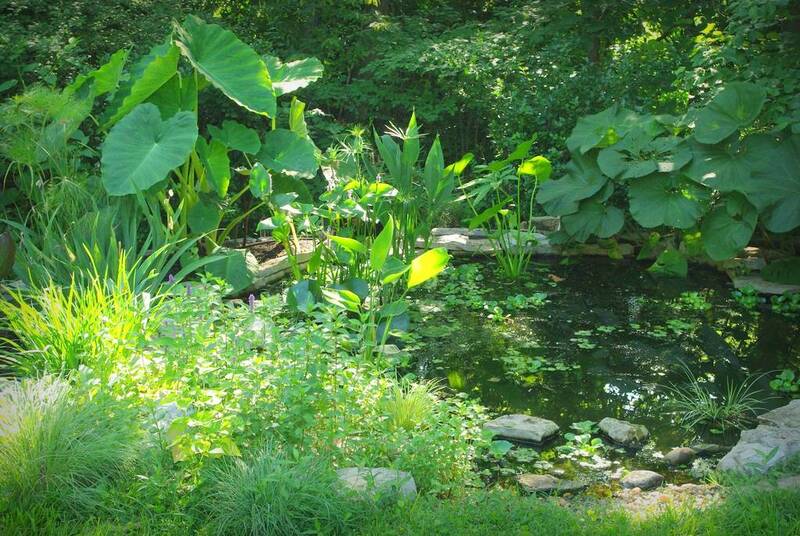 It's probably the single plant that makes the pond so attractive in the late spring and early summer, its 24" (60cm) or larger leaves creating the perfect backdrop to the water. It's just getting started at this time of year, with blooms that appear around April 1 every year here in St. Louis. This is not a plant that is grown for its flowers, as they're really nothing too exciting and open just an inch or two above ground. 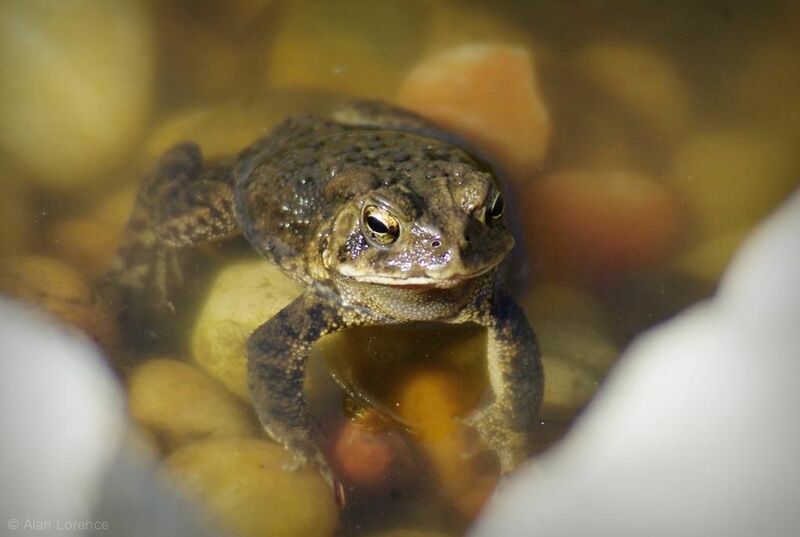 One thing that I've learned in the few years that I've had a pond in my garden is that Spring means toads, who spend most of their lives on dry ground but return to water in order to mate. In Missouri although we have a few species of toads that are only found along the Mississippi and Missouri rivers, the most common species are the eastern American toad (Anaxyrus americanus americanus, formerly Bufo americanus americanus) and Fowler's toad (Anaxyrus fowleri, formerly Bufo fowleri). All of the toads in my pond right now are eastern American toads (from what I can tell), and they are in full mating mode. 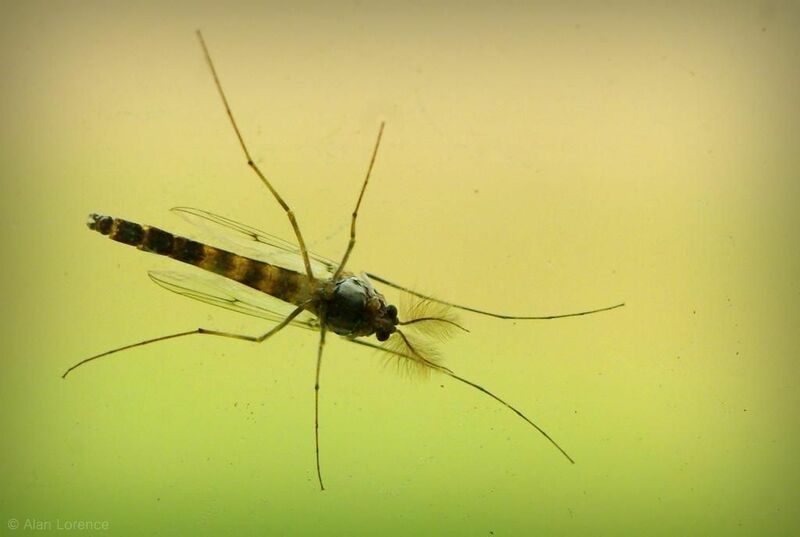 I can see them swimming around all day long even from the bedroom window, and can hear them for most of the day and night. Their sustained, shrill, trill of a call is amazingly loud, and can be heard throughout the neighborhood. Yesterday I posted about an early-season visit to a local nursery: Sherwood's Forest. That trip on Saturday did not end after that, as there are two other nurseries within 5 minutes of Sherwood's. The first is literally next door, Kirkwood Material Supply. 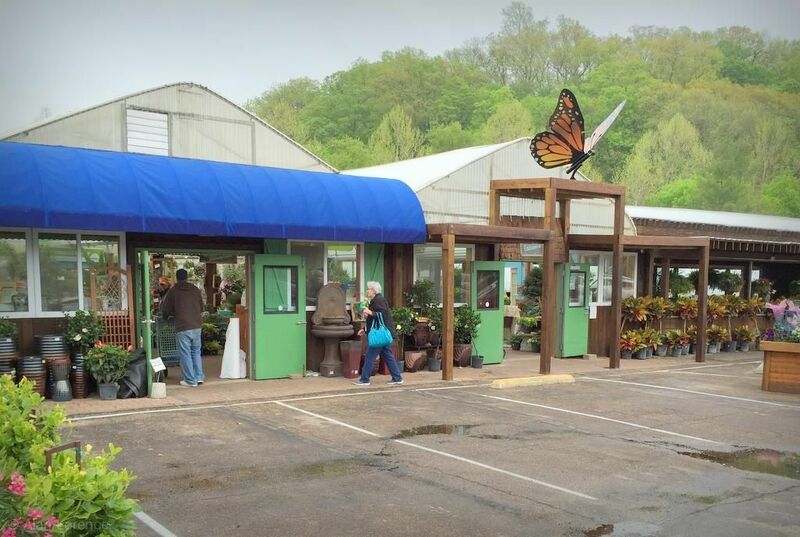 I think this location is technically called "Kirkwood Material Supply Nursery", as it's the one that contains most of the plants along with rocks, mulches, compost, etc. The other KMS locations (including the main one that has the largest selection of rocks and other materials) just carry a few plants.